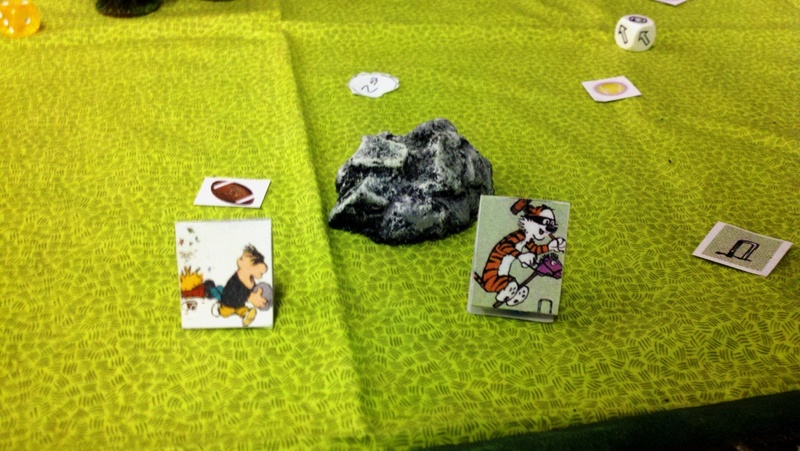 I ran some Calvinball games last Friday night. 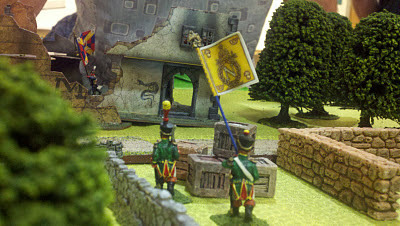 The rules were developed by Mardaddy on The Miniatures Page. For those of you that don't know what Calvinball is (shame on you), it's from the classic Calvin and Hobbes comic strip. It's a "sport" that Calvin and Hobbes played frequently which moshes all sports into one game with ever changing rules. Mardaddy's excellent rules imposed just enough order to create a playable game while incorporating the key concept of making up the rules as you go along. 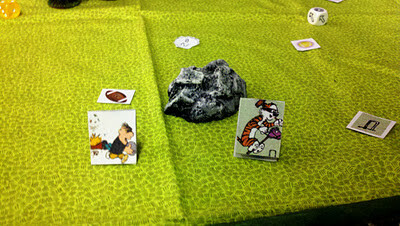 All 4 players (Calvin, Hobbes, Susie Derkins & Moe the Bully) start at home base. Each player is assigned a "calvinball", one of many different types of sports balls (golf ball, soccer, basket, foot, etc) which are spread across the playing field. The players must then run to pick up their calvinball, & then touch the ball to 1st base. Once the calvin ball is "based", they then throw their calvinball as far as they can away from themselves & pick a new type of calvinball. (Note that they throw their current ball before they pick a new ball which could be the same type of ball.) They also draw a "rules change card" which could be anything from being forced to all run backwards, gaining Spaceman Spiff's Zorgomatic Shield, or being required to climb a tree and recite a poem in praise of tigers (the players actually have to come up with a poem on the spot). The play continues as the players each try to base their balls at 1st, 2nd, 3rd & home base, randomly picking a new calvin ball & rule change every time. Of course there's other things you can pick up along the way like hockey sticks, football helmets & water ballons that will help you "interact" with the other players. The key conflict of the games was when Moe the Bully stole Calvin's Little Red Wagon from Hobbes. They continued to fight over the wagon for many turns, but finally Hobbes decided to one up Moe by just winning the game. Here are a few pictures from the games. Not much to look at, I know. The game pieces are cut out clip art with the "figures" just tri-fold standee types. I think Mardaddy lost his copy of the rules, & I only have hard copies. But if there's enough interest, I might be able to transcribe them to a Word file. 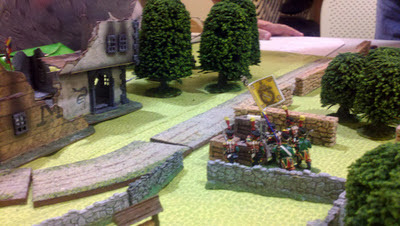 Today, I ran my 1st game of Ganesha Games' Song of Drums and Shakos, their skirmish Napoleonic game. The scenario was Blunt's Payroll, published in the company's free newsletter. It's heavily based on the payroll dispute at the beginning of Sharpe's Rifles. 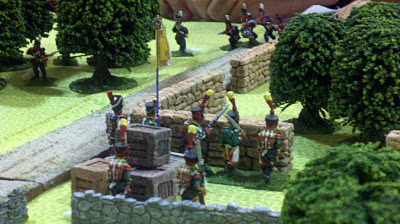 The French, with more but lesser quality troops, must defend the army's payroll chests, from the Portuguese who have fewer but higher quality troops. 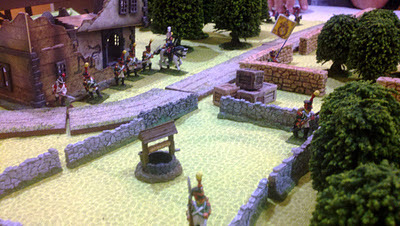 The French set up in & around the ruined inn where they'd camped the previous night. The Portuguese come on from a random edge of the board. I didn't have any British troops, so Portuguese were used as stand-ins. Here is the board layout with the French deployed around the inn and sentries thrown forward. The Portuguese came in from the far side of this picture (behind the French standard). The French Ensign noticed them sneaking through the woods just as a Portuguese rifleman drew a bead on Capitan Pierre Rouge and blew him off his horse, giving Sgt Henri a field promotion. The death of a leader forces a morale check which almost all of the French troops failed. Luckily, when failing morale, having a standard allows troops to use it as a rallying point, running towards the standard, instead of running away. And this actually moved most of the French into cover and a better position to defend the pay chests. 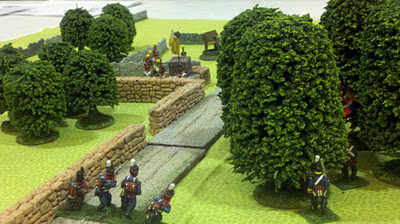 Sgt Henri quickly called for his new command to regroup and take up a position behind the stone wall. With both sides now ensconced behind stone walls, desultory fire was exchanged. The Portuguese decided to move things along by moving behind the trees and occupying the inn where the French had just had breakfast. The Portuguese, recognizing they were being flanked, repositioned themselves behind the cover of the pay chests. The accurate fire from the inn windows finally broke the French morale (they took more than 50% casualties requiring a morale test). In the flight, the French Ensign dropped his standard. A daring Portuguese rifleman dashed out to try to capture an Eagle. But Sgt Henri refused to let his 1st command end so ignobly. So he charged the rifleman, quickly dispatching his opponent. 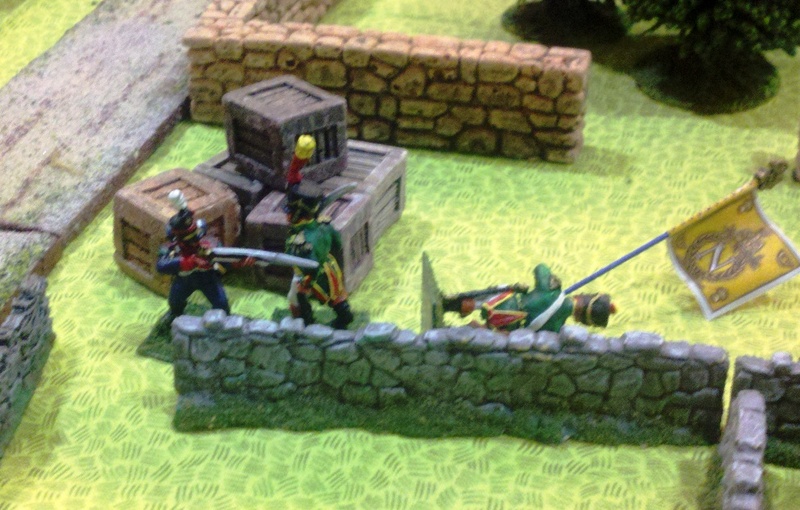 Encouraged by his Sgt's valorous display of courage, a Voltigeur rushes up to retrieve the standard. 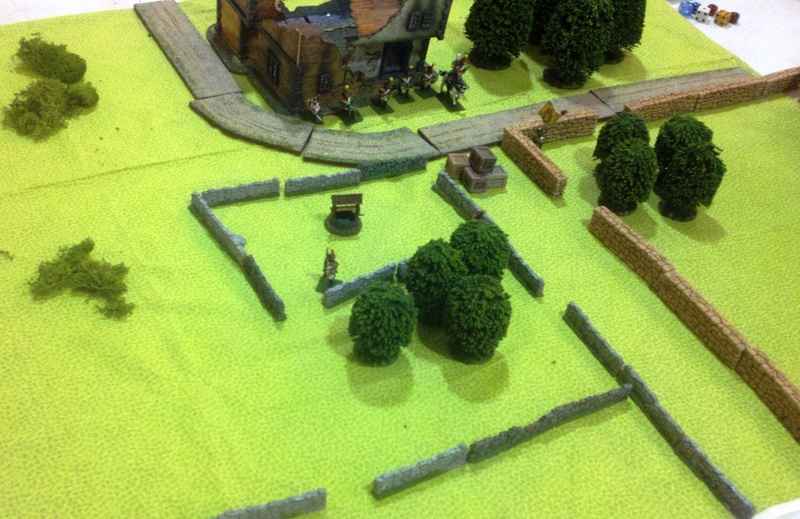 But this was to be their last acts as they were shot down by accurate rifle fire, thus ending the game. I was very pleased with how well the game ran. It took about 2 hours, but that included setup & rules explanation. 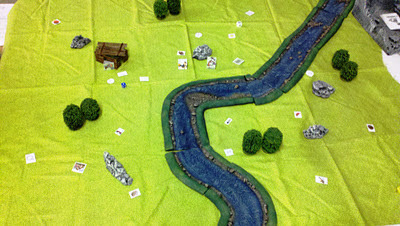 Unfortunately, the French player rolled badly throughout the game while the Portuguese players continued to roll well. Otherwise it might not have been so one sided.